Guwahati, 23 July’2018- Guwahati based start-up companies TraveloPapa and Book and Avail inaugurates their first office in Mayur Garden, ABC, Guwahati. Both the companies which started their venture in the year 2017, has been flourishing successfully from last 1 year and has been operating through their online portal respectively. This is for the first time, that these two companies have joined hands and come together to open the first office in Guwahati and operate from on ground too. The website however shall be operating simultaneously. Clients can now visit them directly and get their deals customized and managed through direct interaction. 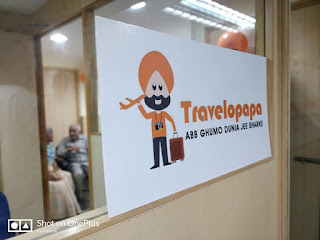 TraveloPapa is a Guwahati based company, which provides budget friendly travel experiences. They offer customized and tailor made travel guides and itineraries according to individual needs. It caters to all sorts of travellers, who are looking for a hassle free trip. They provide local, national and international trips along with visa assistance, accommodation, sight-seeing etc. “We want people to define us with our services that we provide to our clients. We provide plans according to a person’s budget. We believe in our motto that says- Ab Ghumo Duniya Jee Bharke. Budget should not be the reason for anyone to cancel their travel plans”, says Manan Goyal, Managing Partner TraveloPapa. The team comprises of three members Archana Chandgothia, Manan Goyal and Ronak Agarwal. Book & Avail is North East India’s 1st online portal connecting customers with top salons which are equipped with best amenities & highly trained professionals. “We help our clients to find the best deals, offers & discounts on top salons in Guwahati. Find a deal that fits you, pay for it through the website, and go to the Outlet location to redeem it, says Ronak Agarwal Managing Partner Book and Avail. It is first of its kind in entire North East. This website makes it very easy for customers to check prices of the services and select the best one at their convenient time. At present four salons namely Posh, Malaika’s, Scissor Sound and L-Dream are listed on the website. “With the opening of this office, we plan to cater to our customers better and more effectively”, he added. On the inaugural of the office, both the entrepreneurs expressed their happiness and gratitude to the Guwahatians who have overall loved their services. “It is our love for the city, that made us do something that caters to our city and its people”, says Manan, Ronak and Archana.